Yesterday after press time our friend Rachel Bovard, Policy Director for the Conservative Partnership Institute, gave us a heads up that the bill touted by Senate Majority Leader Mitch McConnell as the “Trump wall bill” is anything but a bill to give the President the authority and funding he needs to fulfill his oath of office and his campaign promise. According to Ms. Bovard’s analysis, and our subsequent reading of the bill, the $5.7 billion President Trump has asked for is there, and the authorities from the ’96 law (Illegal Immigration Reform and Immigrant Responsibility Act) are incorporated by reference. This is strong and broad authority to build physical barriers and acquire the land to do so. That’s the bait, now here’s the switch: The wall is then limited by the same restrictions outlined in Sec. 230 of the Omnibus from last March, which expressly prohibits any money being spent on the wall prototypes approved by President Trump, and limits various physical infrastructure in some places to only drones, pedestrian fencing or “planning." 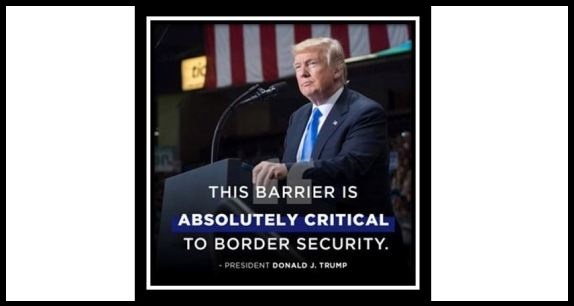 In what can only be termed a slap in the face to the President and the millions of people who voted Republican because Trump promised to secure the southern border, last year the Republican congressional majority passed a spending bill that expressly prohibited the wall that we voted for. As Breitbart’s John Binder explained, the wall funding can only be used for “operationally effective designs” that have been used at the southern border in the past “such as currently deployed steel bollard designs,” the legislation notes. Binder notes the most flexible component of the border infrastructure section of the “compromise” bill is that it allows the Department of Homeland Security (DHS) to determine where best to build the bollard fencing. Previous spending bills have restricted the exact mileage and region where DHS can build new barriers. The legislation would allow the bollard fencing to be built along more than 200 miles of the 2,000-mile long southern border, DHS officials say according to Binder’s reporting. And this is the bill that Mitch McConnell claims will settle the wall funding controversy and end the partial government shutdown? The answer is, YES, and it is all part of an elaborate little Minuet the UniParty on Capitol Hill is doing to convince you that there’s just no support for the Wall. Here’s the first Partita of the Minuet according to The Hill: The Senate leadership on Tuesday struck an agreement to vote on dueling proposals to reopen the federal government. Senate Majority Leader Mitch McConnell set up two votes for Thursday afternoon, both of which will require 60 votes to advance. The first vote will be on President Trump's proposal to reopen the government, provide $5.7 billion in funding for the border wall and extend legal protections to some immigrants for three years. If that fails, the Senate would then vote on a three-week continuing resolution (CR). Democratic Minority Leader Charles Schumer tipped everyone to the bait and switch when he thanked McConnell after he set up the votes and pointed to the Democratic proposal as a way out of the funding fight. "We have a second amendment that could break us out of the morass we are in. ... For the first time, we will get a vote on whether to open the government without any decision one way or the other on border security," Schumer said. Conservatives were quick to recognize the proposal for what it is – a UniParty plan to pull the rug out from under Trump and end the shutdown without resolving the underlying crisis at the border. It seems incredible but the Senate funding bill does not allow the steel slat barrier envisioned by President Trump to be built using the $5.7 billion of funds that would be allocated for ‘the wall.’ Instead it would allow fencing and repairs. It is time for Congress, including the Republicans to get serious about border security and it is disheartening that this type of border barrier bait and switch would be attempted at this stage of the shutdown. Americans for Limited Government urges that the proposed funding bill in the Senate be defeated unless amended to allow for a real barrier to be constructed. It is time to stop playing games with our nation’s security. Here's our prediction – no Democrat will vote for the “compromise bill,” even though it gives amnesty in the form of three-year work permits to about a million illegal aliens and foreign nationals who would be shielded from deportation. Next up will be Speaker Pelosi’s announcement that the “compromise” bill is DOA in the House, leaving the Schumer “reopen the government with no wall” bill the only game in town. Should Democrats kill the Trump proposal – as we believe they will – the President should feel empowered to begin to explore executive action to address the national security crisis at our southern border – including using the military to construct an effective border wall – and he should definitely refuse to go along with any plan to fund the government without addressing the wall and the border crisis.